For many of us, our vehicles are our second home. We use them to travel back and forth from our jobs, to visit family, to go shopping, and countless other places. So the likelihood of something eventually going wrong while you’re in a vehicle is significant. No matter what part of the world you are in, you need to be prepared for those unforeseen circumstances that often take us by surprise. 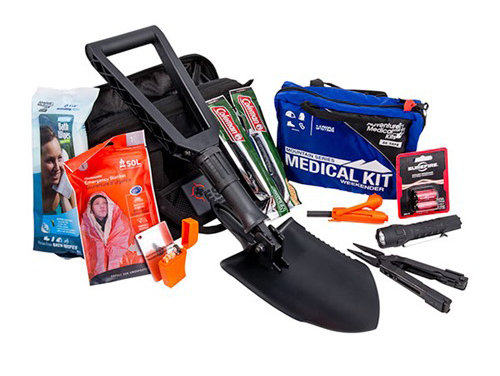 You’ll find a wealth of information online about being prepared during the winter months and also numerous lists of must have items for those extreme weather moments, but here at the Ultimate Bug-Out Bag List, we want you to be prepared for any situation during any time of the year. The Automobile Association of America handles approximately 30 million roadside calls for assistance each year. Depending on if you are a member of a road side assistance program, where you are located, and what the weather conditions are, you could be waiting for quite some time. In other words, at any given moment your preparedness could be put to the test. Based on the situation, having an emergency kit in your vehicle could simply save you a great deal of time and hassle, or it could even mean the difference between life and death. We are often faced with extreme situations and temperatures and are left deciding at the last minute what to do when a critical event is already upon us. Having a bug-out bag or emergency kit in your vehicle at all times is similar to having an insurance policy in place. Putting together emergency supplies for your vehicle can be as simple as buying a prepackaged kit. These off the shelf units typically contain a fair variety of basic items that are a good foundation and can easily be expanded upon. 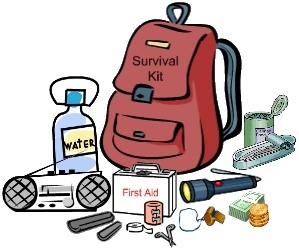 Otherwise, it’s a good idea to start thinking about what items would go into an emergency kit that you put together. Often when putting these kits together, we fail to remember certain items that could be very useful. 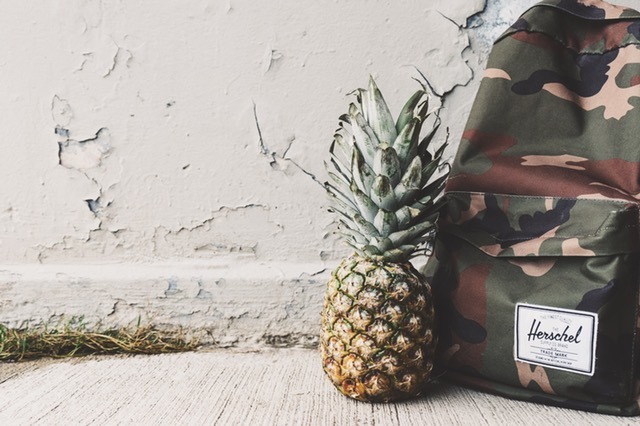 Of course as with any bug-out bag or emergency kit, each of us is going to have preferences concerning items or brands, but in any case, it is critically important to at very least have your basic needs covered. Whenever you’re considering putting together a bug-out bag or emergency kit, think about the environment you live in and what you need to be prepared for. Obviously, not all of us are going to need to be prepared for hurricanes, earthquakes or volcanoes, but being prepared for any eventuality does help us feel more secure and could help save a life. So how should you start putting your gear together? 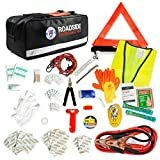 Consider how many people this kit is for, the size of your vehicle, space where the kit is going to be kept, and don’t forget to add items if you have a pet. Also depending on where you live and if you are traveling, think about what sort of temperatures you may encounter. 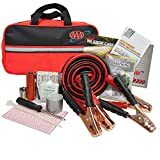 An emergency kit for your vehicle is just a modified version of a bug out bag. If you haven’t already done so, take a look at our Bug-Out Bag List for essential, recommended, and optional items to consider. 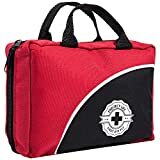 When putting together your emergency kit, you want to make sure that you have a bag or pack that is large enough to accommodate the number of people that travel with you. On a personal note, I like to pack a few extra supplies for when I happen to be traveling with friends or family members. Give yourself enough room in your pack so that you can add or subtract items as necessary. When you’re searching for an appropriate container for your supplies, also think about the types of weather conditions you want to be prepared for. If you ever have to leave your vehicle with your pack in tow, then a wet kit can often mean the end of numerous items, so it is strongly recommended that a water resistant or weather proof bag be used. 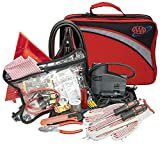 Because this kit is specifically designed to cover your needs while in a vehicle, be aware of the problems that could arise from any mechanical malfunction. The first thing to consider is your safety. With this being said, it is always a very good idea to include items that will help you be seen by other vehicles in the area. Adding a pair of roadside flares, a reflective triangle or vest, or any other flashing or reflective device will only help you stay out of harm’s way. Also include either a hand crank flashlight or one that uses batteries, and also a small fire extinguisher. Please be very aware that manufacturers of fire extinguishers have rated their products for specific temperatures. Make sure that the automotive fire extinguisher you purchase will maintain its integrity in the high temperatures of summer, as well as the freezing temperatures of winter. As far as the flashlight is concerned, you may even want to think about investing in one that is hands-free such as a head lamp, light with a mounting system, or one with a magnet or stand attached. A variety of car problems could mean an abrupt end to an otherwise pleasant drive. Although much of this might seem like basic information, many of us are often pre-occupied with busy schedules and easily overlook preventative maintenance and preparedness. It’s always a good idea to have a small toolbox with a selection of various tools (pliers, screwdrivers, a hammer, crescent wrench, vise grips, etc.) in the trunk of your car or behind the seat. Think about including tools that are adjustable or vary in size. Of course, you should already have a car jack, tire iron, and spare tire somewhere in your vehicle for those unfortunate moments when a blowout occurs. Become familiar with your car jack and how to use it if you have not already done so. Underinflation is the leading cause of tire failure; it is therefore recommended that you check the pressure of all tires on your vehicle including the spare once a month. Keep a tire pressure gauge in your vehicle or your pack at all times. Consider investing in a small portable air compressor and a bottle of foam tire sealant for those minor punctures. Be aware that although foam tire sealant can quickly get you back on the road, some tire shops will refuse to repair the tire because the sealants will leave a sticky residue inside. Also, make sure the bottle of sealant is labeled as non-flammable. Another device that is always recommended is a pair of battery booster/jumper cables, preferably 12′ or greater. If you don’t want to rely on others for a battery boost, then you will want to purchase a charger. Some battery chargers can weigh-in the neighborhood of 20 lbs, so this would be another item to simply store in the trunk or behind a seat. For those unexpected electrical problems that you may run into, keep an assortment of fuses on hand for your particular vehicle. Checking and changing a burned out fuse is fairly easy and could put you back on the road in no time at all. Refer to your owner’s manual for detailed instructions. Other useful items that would increase the likelihood of a return to the road are the fluids of your vehicle such as antifreeze, oil, transmission fluid, brake fluid and washer fluid. These fluids are the life blood of your vehicle and need to be checked and changed on a regular basis. Once again refer to your owner’s manual for further information on your specific vehicle. Don’t forget to also include a funnel for those fluids and a few rags or paper towels. If something is leaking your first inclination may be to reach for a roll of duct tape. Keep in mind that duct tape has a melting point of roughly 200 degrees, so it may not get you as far as you would like. Look into buying a roll of silicone based tape which is self-fusing and withstands over 500 degrees of heat as well as 8000 volts. Although having a cell phone with you at all times has become common place, not only is it a great idea for communication but also for its ability to take photographs. If you ever get into a fender bender, then a camera comes in handy for recording the condition of the vehicles involved for insurance purposes. Remember to also keep a car charger in your vehicle so that you can simply plug in your phone and keep it charged. Of course, many of us live in a variety of climates, and the weather does seem to be quite unpredictable at times. For those of us that have to deal with freezing temperatures, we know the importance of keeping a close eye on our tires and road conditions. With that being said, keeping a bag of kitty litter or sand in the trunk could help you escape when stuck in the snow. 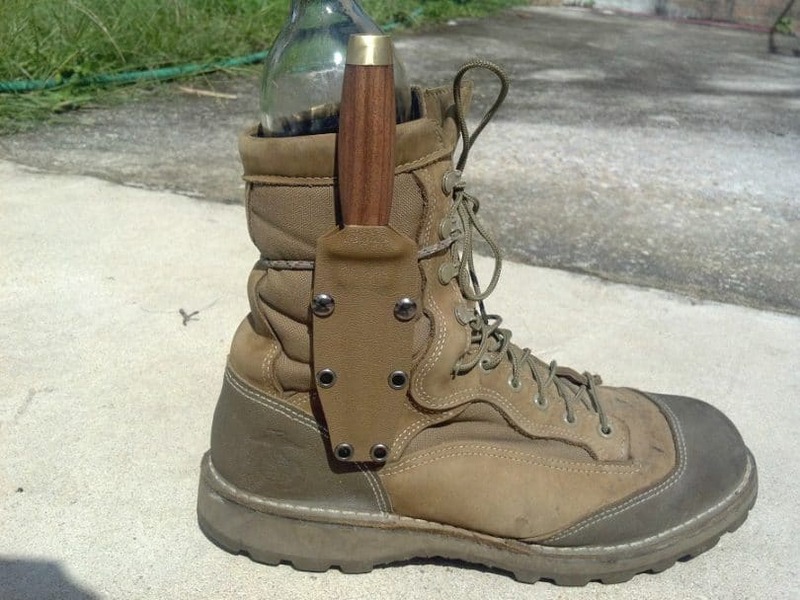 Another very handy tool for such an occasion would also be a snow shovel or folding shovel. Additionally, be prepared by having a snow brush, an ice scraper on hand. Many of us have recently heard through a variety of news sources of drivers having to spend the night in their vehicles due to winter weather. So now that we’ve covered vehicle maintenance and preparedness lets also discuss the various items that are important for human needs and survival. When thinking about an emergency kit that’s going to be kept in your vehicle be sure to consider the changing temperatures and note any expiration dates that happen to be printed on food or medical supplies. Simply enter the expiration dates on a calendar, on your phone, or on a computer as a friendly reminder of when to swap out any expired gear. Also be aware of the type of water container you plan on using. Personal preference is to stay away from plastic containers and go with something that is food-grade stainless steel, BPA-free, and has no glass vacuum insulation. These vacuum insulated containers perform well in a variety of temperatures and will keep your water from freezing for an extended period. A drawback to these containers is that they are fairly small with the largest holding roughly 64oz. 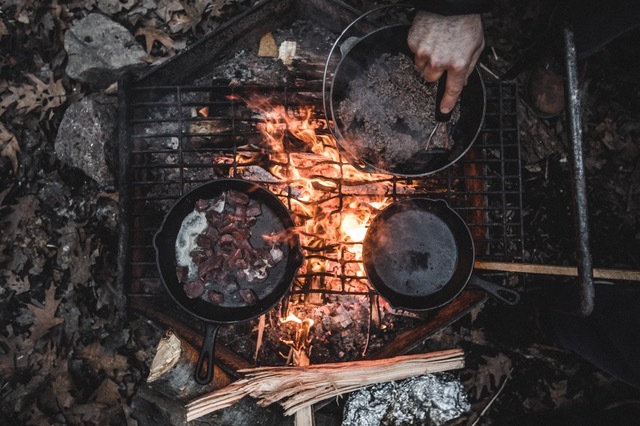 When choosing the type of food for your kit, you want to use the same logic as with any bug-out bag. Pack items that will remain stable in fluctuating temperatures such as MRE’s, granola bars, dehydrated food or freeze-dried products, or even a jar of peanut butter. Remember that the longer some food products are in a hot environment, the shorter the shelf life. MRE’s at a constant 120 degrees will last approximately one month as opposed to storing them at 80 degrees which will prolong their shelf life to roughly 3 years. Notice the calorie content of the types of food you are packing and if anything requires the addition of water to prepare, then adjust your overall water reserves accordingly. For in-depth information on MRE’s click on the link. Another item you don’t want to leave out of your vehicle is a well stocked first aid kit. First aid kits usually don’t weigh very much, but they can obviously cover a wide variety of emergencies. Be sure your kit will cover anything from small scrapes and minor burns to situations that require major bandaging. Also include a small bottle of hand sanitizer, a few alcohol pads and nitrile gloves, and a small trash bag. 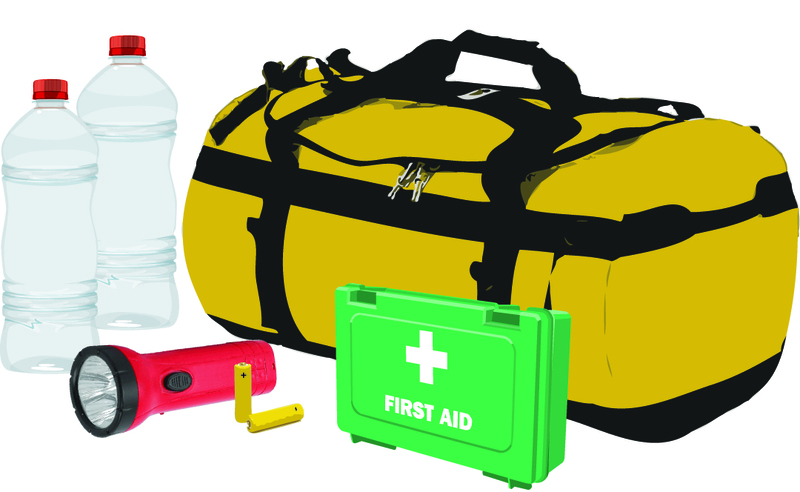 Familiarize yourself with the workings of each item in the kit and know what to do before faced with an emergency situation. For additional information as well as a list of training and certification programs, visit the American Red Cross. As stated previously, temperatures can be quite problematic and have adequate protection from the elements is necessary. Include in your pack extra articles of clothing such a hat, scarf, gloves, socks, sweater, etc. Certain fabrics can help keep you dry and warm while others can make a bad situation worse. Moisture or water magnifies the effects of temperature which is why certain parts of the world such as Houston feel much hotter during the summer than many dry areas of the U.S. You want to have clothing that will hold on to the body’s natural heat and traps in the air. Polyester and wool are both known materials that resist water fairly well and can absorb moisture and then release it into the air to help keep you dry. Avoid cotton clothing as it will soak up moisture and hold on to it until external conditions allow it to dry. Nylon and Rayon both have similar properties to cotton, as they will draw away your body heat and keep you wet for an extended period. In addition to warm clothing, also include chemical hand warmers, a blanket, poncho, sleeping bag, and tarp. As an aside, every year we are often either told about or see videos online of someone that has fallen through the ice, and no one can seem to help them because of a lack of rope. It’s an extremely troubling situation and one that can be avoided by including 50 to 100 feet of rope, paracord, or amsteel blue in your kit. Not only can it be used during an emergency such as the one described or a flood, but it has countless other uses that make it a necessity. If you are wanting to go with a heavy duty tow-line but want a lightweight alternative to a chain, then go with the steel blue which serves as a wire rope replacement and comes in various strengths. Keep in mind that this kit is intended to keep you covered in an emergency situation while you are in a vehicle. Its primary purpose is to help in signaling your presence to other motorists, to help you get assistance, and to aid you through challenges you may face. In no way are these recommendations meant to take the place of that all important phone call to emergency services. Please dial 911 if you are in an accident or happen to be facing any critical situation. Your phone number and location aren’t always relayed to the operator when using a cell phone so give them your information and your best approximation to your whereabouts. Here at the Ultimate Bug-Out Bag List your safety, survival, and preparedness are our top priority. Let us know if you have any questions or suggestions about our list.